Founded by Annette Dieudonné, Cécile Armagnac, Doda Conrad, and François Dujarric de la Rivière to keep alive the memory of the two musician sisters whose personalities bore the stamp of genius. CNSM de Lyon: "Une pédagogue dans son siècle, Nadia Boulanger"
24 au 27 février : Colloque avec Dominique Merlet, Narcis Bonet, Josiane Bran-Ricci, Laurence Languin, Jérôme Dorival sous la présidence d'Alexandra Laederich. Concert de mélodies, Concert de l'orchestre du CNSMD + ensemble vocal (Psaume 24, Monteverdi, Ravel, Debussy) et Concert de Musique de chambre. Concert à Berlin = juin 2004, Berliner Cappella accompagné par le Berliner Sinfonie Orchester, deux chœurs avec orchestre, Hymne au soleil inédit de Lili Boulanger, et Soir sur la plaine. The Fontainebleau Schools of Music and Fine Arts are�old and original institutions grouping together courses in music, architecture and fine arts. From the beginning, the American Conservatory had among the teaching staff a young composition/harmony professor, born of a Russian mother, who was to mark the conservatory's musical education with her energy, her knowledge, and her spirit until 1979. This woman was Nadia Boulanger. In recent years the American Conservatory at Fontainebleau has widened its mission of initiation and discovery of French music and culture to include not only the best American musicians but musicians from all parts of the globe. Courses in piano, violin, viola, cello, composition, theory and chamber music will not only provide opportunities for educational advancement, they will also set the stage for diverse cultural exchange. The Association, based in New York, maintains critical links with the administering association in France, sustains endowed scholarships and provides an annual newsletter and special events for its alumni. Visit the online version of the exhibition "The tender tyrant : Nadia Boulanger, 1887-1979. 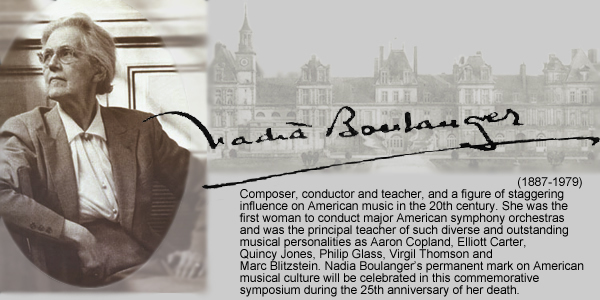 This exhibit features scores on loan from the M�diath�que Nadia Boulanger, CNSMD Lyon. A week devoted to Nadia and Lili Boulanger will take place in Lyons, February 24th-27th, beginning with a one-day conference in conjunction with the Foundation Lili and Nadia Boulanger. If you want to see only students manuscripts, you have to write in MOT(S) DU TITRE : et musique manuscrite. The online presentation of the Aaron Copland Collection at the Library of Congress includes approximately 75 letters to, photographs of, and unpublished writings about Nadia Boulanger. Type "Boulanger" in the Search box. EAMA runs summer music programs in Composition, Piano and Violin in Paris, France - taught in the tradition of the legendary Nadia Boulanger. These programs offer intensive study of the crafts of counterpoint, harmony, analysis, as well as composition and performance taught by professors from The Juilliard School, Mannes College of Music, Paris Conservatory and the Ecole Normale de Musique de Paris.